Learning To Love You More / LTLYM is best described as a chameleonic cat with nine lives. Here, all tastes are catered for: it is a website and an art project, a series of exhibitions and do-it-yourself assignments. It is image, text, and sound; it is film, photography, and performance. And most important of all, it is accessible to anyone who wants to contribute to it. 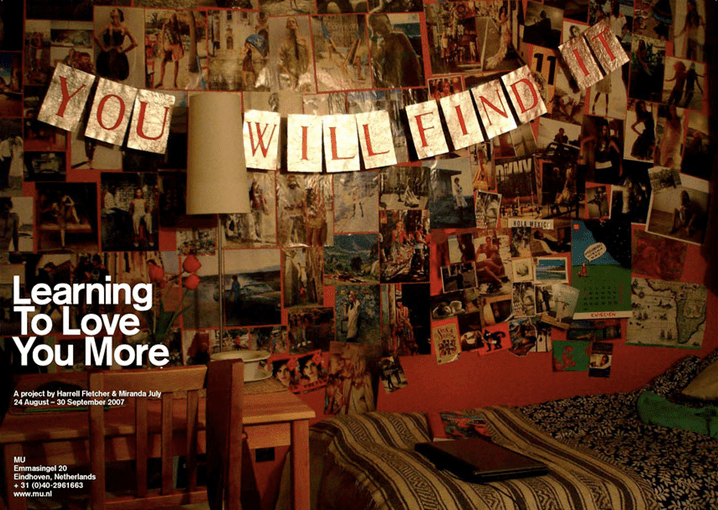 Five years ago, in 2002, Miranda July and Harrell Fletcher initiated www.learningtoloveyoumore.com. On this website, the two American artists formulate creative commonplace assignments that can be carried out and sent in by everyone. Reports, by now more than five thousand, are sent in and posted on the website. This makes learningtoloveyoumore.com not only an extensive archive, but also a database containing an immense range of various quality levels of artistic views and solutions. Vulnerable and extremely private, but also moving and unexpectedly associative in nature, virtually every one of them touches on a desire to visualize shared interests. The organization of this project is given as an assignment to nine young curators from the California College of the Arts (CCA) in San Francisco. In collaboration with the two artists, a large number of the nearly two thousand reporters, and MU, they will stage the most extensive presentation of the results so far. The exhibition runs parallel to the publication of the first LTLYM book by the international publishing house Prestel. View affiliated publication & press.